The Amazing Acrocats! Starring the Rock Cats! The Amazing Acro-cats is a two-hour show that features over a dozen fabulous felines (all former orphans, rescues, and strays) walking tightropes, pushing carts, skateboarding, jumping through hoops, ringing bells, balancing on balls and turning on lights. We meow have some new cats and new feats in the show too! We have a celebrity in the troupe, Alley, who was just awarded Guinness Book World Records title for longest jump made by a cat - but wait there’s more! 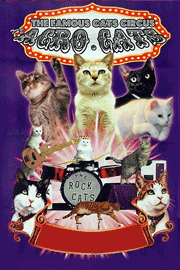 Do you know about the ONLY CAT BAND IN EXISTENCE – The Rock Cats? With Oz on guitar, Asti on drums, Nue on keyboards, and Sookie on chimes - there have also been new additions to the band including cats on saxophone, trumpet, Albacore Tuna on woodblocks and of course Ahi Tuna (who plays cowbell.) The Tuna's backing band really strut their stuff with their own style of original music. Cluck Norris, a chicken on cymbal and tambourine, isn’t “kitten” around - she usually steals the show! A portion of every shows’ ticket sales go toward cat and kitten rescue! Martin advocates adoption from local shelters and her own organization, Rock Cats Rescue, and educates cat lovers on the value of clicker training and foster/adoption/rescue – especially by taking adoptable cats on the road, making the Amazing Cat-Bus a mobile fostering unit. Over the past four years, Samantha Martin (the Chief Executive Human and animal trainer) has found homes fur over 220 cats and kittens and continues to take cats in need and help them find their furr-ever homes.